Rescue Rebuild, a signature program of GreaterGood.org, is teaming up with Miranda Lambert’s foundation Mutt Nation in Lindale, Texas. The two nonprofits will be working with the City of Lindale to restore and repair the existing property to be able to increase pet adoptions in the area. Once completed, the center will be able to host up to 100 pets. Construction is set to begin this fall and they are asking for volunteers to offer time and money for the project to be completed. Houston, TX (August 24, 2017) – Rescue Rebuild, a community-driven volunteer program of GreaterGood.org that works to rebuild, repair, and renovate animal shelters and rescues in need has announced a partnership with MuttNation, the foundation of country music singer Miranda Lambert in her hometown of Lindale, Texas. The two organizations are raising funds to complete renovations to an older building donated by the City of Lindale with the goal of increasing pet adoptions in the area. The new facility will include a new meet & greet area for potential adopters to meet pets, two dog parks, as well as updated amenities throughout the building. In addition, the City of Lindale will also donate two acres of land as well as ongoing maintenance of the dog parks. The Tyler Junior College’s Vet Tech Program will continue all operational and maintenance tasks. Once completed, the new adoption center will be able to host up to 100 pets at adoption events. Lambert started the MuttNation Foundation with her mother, Bev, in 2009 to shine the spotlight on the needs of shelters and rescues. 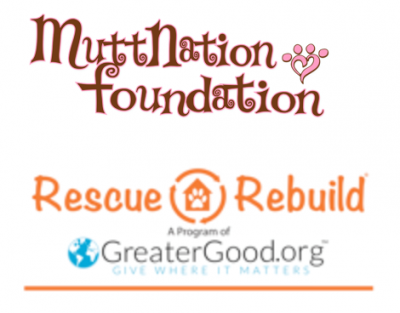 In 2014, MuttNation and GreaterGood.org teamed up through the Rescue Rebuild program to improve shelters. This latest partnership with Rescue Rebuild will allow them to expand their impact on the lives of shelter pets yet again. In celebration of their 10th anniversaries as non-profits, both organizations are giving back to those in need. Construction on the adoption center and dog parks is set to begin this Fall. Volunteers are being asked to help with construction and donations are still needed to fund the project. For those interested, visit RescueRebuildRocks.com. To learn more about GreaterGood.org’s Rescue Rebuild and its partners, visit rescuerebuild.greatergood.org. For more information on MuttNation, visit www.muttnation.com. Rescue Rebuild is a shelter renovation program of GreaterGood.org that recruits volunteers from all over the country to help animal shelters in need. The organization travels to selected shelters in need to complete general repairs and renovations. Country Music News Blog participates in advertising programs that help fund the operation of this site. For more information please visit our privacy statement. This entry was posted in Community, Miranda Lambert, Press Releases by Shauna "WhiskeyChick" Castorena. Bookmark the permalink.